Three seasons ago, a Triple 3 campaign was treated as something of a phenomenon. The feat — finishing a season with at least a .300 average, 30 home runs and 30 stolen bases — had been accomplished before Tetsuto Yamada and Yuki Yanagita both did it in 2015, but that last time had been in 2002, by Kazuo Matsui. Triple 3 became the new, hot thing in Japanese baseball in 2015 as Yamada and Yanagita each moved closer to it late in the season. Their chase was covered heavily in the media and they were celebrated once the job was done. After the season, Yamada and Yanagita were crowned MVPs of their respective leagues. The phrase itself even won an award, being crowned as the buzzword of the year in Japan. Which is why there should be more noise about the shot they both have at doing it again this year. It’d pretty amazing if they each managed to do it again. Before 2015, there had only been eight Triple 3 seasons in NPB history. Now there could potentially be five from 2015-2018 alone. The relative scarcity of such seasons should especially put Yamada’s all-around performance into perspective. The Tokyo Yakult Swallows star is already the only player to have recorded two Triple 3 seasons, in 2015 and 2016, and he’s in position to add a third. He’s been on a tear at the plate recently and is nearing the 30-homer threshold. He’s hit six in his last nine games and is currently tied for the Central League lead, with teammate Wladimir Balentien, with 24 homers. Yamada is also in a favorable spot with 22 stolen bases, another CL best. 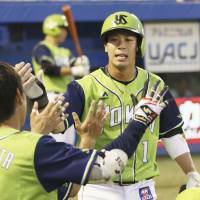 Yamada’s bid may come down to batting average. He’s been on fire this month, with a .420 average. That’s got him at .312 for the season and makes the remainder of the year crucial to his bid. From 2015-2017, Yamada hit a combined .283 after Aug. 1. So it’s going to be an interesting pursuit to watch the rest of the way. 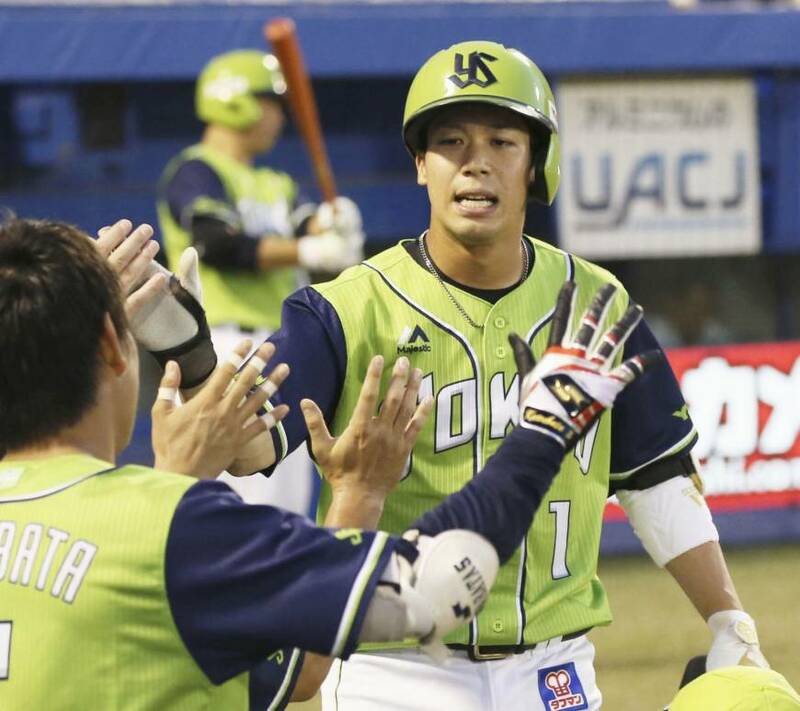 Yanagita has no such concerns about his average, as the Fukuoka SoftBank Hawks star is currently cruising along at a Pacific League-best .355. He also has 24 home runs. The question for Yanagita is stolen bases. So far, he only has 16. His best monthly total this year was seven in the first month of the season, and he’ll need to get on his grind to reach Triple 3 status again. Yanagita, who has only been caught stealing twice, can still get there, but it’s quite the mountain to climb. Fans have grown accustomed to Yamada and Yanagita being great, but the seasons they’re both having shouldn’t be taken for granted. Even among NPB’s best, they stand out. Right now, there are 23 players with 15 or more home runs and 14 qualified players batting at least .300. Only seven players are doing both. Only Yamada and Yanagita are doing both and are also currently in double-digits in stolen bases. They also lead NPB in WAR (per Deltagraphs), with Yamada’s 5.4 just ahead of Yanagita’s 5.3. The Hiroshima Carp’s Yoshihiro Maru is third at 4.8. The current congestion in both leagues suggests the race for the pennants and spots in the Climax Series will be extra spicy this year. Even so, fans would do well to keep an eye on what Yamada and Yanagita manage to cook up down the stretch.